North Missouri farmer Gary Porter's innovative grain handling system helps him get a jump start on corn harvest. Gary Porter anticipates a swift and smooth harvest of his 2011 corn crop. The modern grain handling system, installed on his Mercer County farm in 2010, has given him the extra confidence to make that prediction. Porter's unique system features four GSI bins with 160,000-bushel capacity, a dryer powered by natural gas, and a pneumatic system that transfers corn into storage bins. The system makes it possible to harvest corn and soybean crops with clockwork precision at Porter Farms. "The key to a smooth harvest is to avoid bottlenecks," Porter says. "We have to keep our combine and grain cart going full speed." 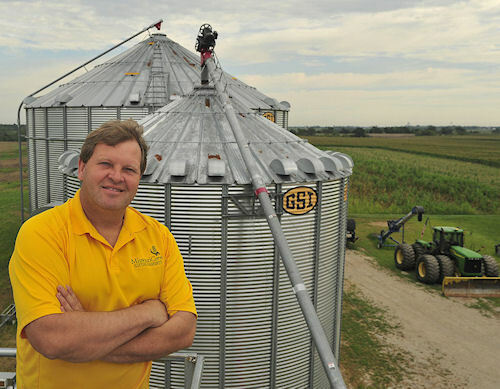 Gary Porter, Mercer, has invested in a new on-farm grain handling system to protect his valuable grain crops. In this month's Missouri Ruralist Web Exclusive video, Porter gives a tour of his new grain-handling system. He explains how the natural gas-powered dryer, pneumatic grain transfer and bin manager system all work to protect his valuable crops during and after harvest. Grain trucks haul the corn from the field to the Porter's 25,000-bushel wet holding bin. From there, an automated system is set to kick on the augers when needed to fill the adjacent top-dry bin. The top dry holds 1,200 bushels of corn, right in the roof, where heated air brings corn up to a preset temperature, and then a set of chutes open at the bottom of the top dry, and it lets the corn fall to the lower portion of the bin. "It does that three times an hour, 400 bushels each time, so it adds up to 1,200 bushels an hour," Porter points out. "When the top dry bin is full (it holds about 15,000 bushels) I can start transferring with my pneumatic system to my big storage tanks. It blows corn through the tubes, up the side of the wall, into the top of the storage bins. Aeration in those bins will cool the grain down so we can store it for the rest of the winter." Another feature of the new grain storage facility is the Bin Manager system. "There are cables hanging down from the roof inside the bin at about five locations, depending on bin size and diameter," Porter says. "This monitors the grain temperature and moisture." The system has already paid off. "One morning last fall I was checking the bins and one cable indicated a hot spot about 8 feet off the floor. It kept spreading to other cables," Porter recalls. "We increased the aeration and started moving grain. Without this system, there is no telling how many bushels I might have lost due to grain going out of condition."